These chairs are very nice! I enjoyed them so much, I bought six more for my formal dining room. They're solid, sturdy, and well-crafted. I'm not a small person and they hold my weight very well. They're made by Safavieh so the quality is good. The upholstery and padding is thick, firm, and durable. I was a little worried when the box arrived and it looked like it had taken a serious beating, but the packing was solid enough that the chairs were unscathed. The cloth is a textured grey linen with a little bit of a rougher finish. I think they'll hold up well to any stains or clean-up from food accidents. The white finish is a nice, milky color but not an ivory. I'm really happy with this purchase! Bring charm and sophistication into your home with these carved mahogany wood dining chairs. 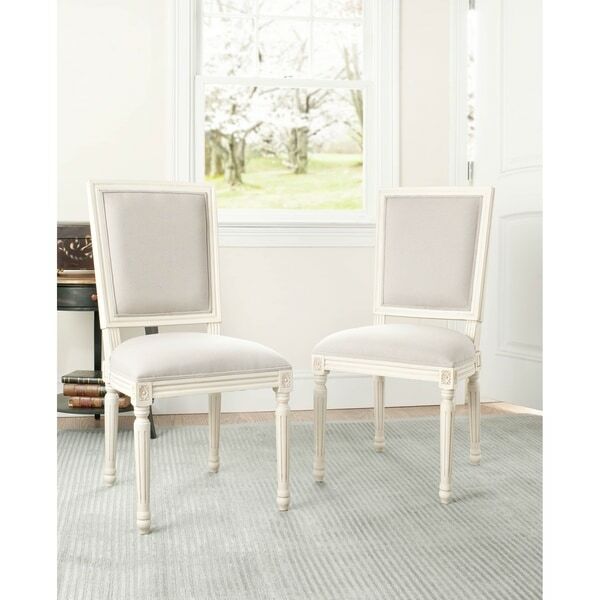 The set of two chairs features solid distressed oak with a white finish and a light grey cotton blend upholstery. chairs were sturdy and decent quality for price. had to return them bc the description did not match product. wood is not white, and thus did not match the table we purchased the chairs for. color is a cream with a slight yellow hue. fabric is a dull grey. If you are looking for some extra seating these chairs are great. They are smaller in scale, but otherwise just as they appear. I would not recommend them for everyday use. The white is an alabaster white, the grey seat is more of a putty color. They are solid wood, the seat is heavily padded in a rigid dense foam. These are amazing chairs. They are the perfect White wash and Grey fabric. The White is an off White but it looks really nice with the Grey fabric. They sit well and are very comfortable. I bought 6 of these chairs for an antique-white colored table in our dining area. The chairs are better than I expected. I buy a lot online and these chairs are more than I expected. For the price, they seem way more expensive in person. Although they are very light weight when you lift them, they appear heavier than they feel. They match my table perfectly! My husband even said he was really impressed with these chairs. None were damaged and they all came assembled so it was so easy! I love these chairs. I am delighted with my new chairs. Since this was my first purchase on Overstock.com I was a little apprehensive about making such a large purchase (6 chairs), but once I received the chairs, I knew I made the right decision. They add such an updated look to my antique dining room table and hutch. The quality is very nice, and the color is a cross between gray and taupe which is exactly what I wanted. The chairs are a little stiff when sitting on them, but I prefer that rather than having something that you sink into, after all it's the dining room, not the family room! One of the chairs arrived broken but I received a replacement immediately without a hassle. The customer service dept. was wonderful and responded right away. I would definitely order from Overstock again. Nice cream white color and soft grey fabric. They are a bit stiff when you sit on them but are still comfortable. I plan on pairing them with my grey washed dining table as end accent chairs. Overall I'm happy with the purchase. There was one small fabric piping that is coming off that I just need to take a hot glue gun too. Not worth sending back for that. When I first ordered I was a little sceptical, I had never ordered furniture on line before , so I order four chairs and absolutely loved them they really looked great with my table. I then turned around and ordered 2 more later. I had such a hard time finding reasonably price chairs in this light wood color. I was so glad the price was reasonable. If I had one complaint it would be about the delivery service. They left the chairs setting in my driveway near the street. My son just happened to look out the window and see them. I wasn't required to sign anything or nothing they just left them there. It was a good thing that they were package really well and was not damaged. Over all this was a good experience. The chairs are really comfortable. We're using them as conference table chairs and have been very pleased so far. We'd done a lot of shopping around, and the price for two chairs was really very good. Most everything else we looked at was over *** per chair. Since we were looking at buying a number of them, this was a fantastic savings. The color of the fabric has a little more blue undertone than the picture onsite, but the chairs were very nice. A soft white, but definitely not ivory or bright blow your socks off white either on the wood. Wow, these chairs are uncomfortable! The ones I received from Overstock were damaged, so I sent them back. On one of them, the seat back was not attached well to the seat cushion, and so the back moved back and forth. On the second chair, the wood had been damaged in shipping and was splintering at the upper corner of the seat back. Aside from the shipping mess, the chairs are sturdy but the cushions are just too tight and the underlying foam too dense for them to be comfortable. It's a good deal, but not worth it if you care at all about comfort. If you're ordering them as occasional chairs (and I mean, occasional - like rarely use, leave in a corner to add a finishing touch to a room kind of thing), then go for it. Otherwise, save your money and buy something more comfortable (RH and many other retailers have similar chairs for slightly more depending on sales). Otherwise, you will regret this purchase! The quality of the chairs are fair, great style as it resembles chairs that are way more expensive. The great has a little bit of a lilac tone to it which is hard to detect in the photo on the website. I love these chairs, they are stylish and well made. Specially attractive is that they are lightweight and one does not have to wrestle to move them from one place to another. They make a great addittion to my French Provincial dining room table. Taupe linen fabric goes with all colors and looks very elegant. My husband and I just moved into our new condo. The chairs were purchased for my breakfast room. After one month of use by my 7 foot tall grandson, they squeak very badly. Will have someone come in to fix this. The style is beautiful and they perfectly match the table color even though it is made by a different company. We love our new chairs. They are sturdy, comfortable, and yet very light to move around. The only thing that I am displeased with is that I decided to order two more and they were out of stock. However I am hopeful they will get more soon and I can order two more. "What is the weight capacity for one of these chairs?" "Hi! I was wondering the seat height as well as the weight of an individual chair! Thanks you!" "is the finish antique white or bright white?" Hello hickorymarsh, we appreciate your inquiry. According to the posted reviews, is it more of an off white (cream toned). We hope this information has been helpful. Thank you for shopping with us. Have a great day! "is there a table that matches the chairs?" Thank you for your interest in the Provincial Carved Mahogany Light Grey/ White Side Chairs (Set of 2). we did some extensive searching and these chairs do not have a matching table unfortunately. We do have other tables that will go with it perfectly but not a direct match. We hope this helps. Have a great day. "Is this the price for the set or for just one chair?" Thank you for your interest in the Provincial Carved Mahogany Light Grey/ White Side Chairs (Set of 2). The price is for 2(two) chairs as said in the title or product description. We hope this was helpful. Have a great day. "Is there a taller version of this chair, i.e. counter height or 30" seat?" Im sorry I could not find that we do have any. "Can the material be sprayed with scotchgaurd?" Concerning scotchguard, we never test our fabrics against the different types of protectors out there because it’s too many out there. I don’t know how the fabric would react. The only suggestion is to try it out in a very small corner and let it settle for a couple of days and see if there’s any adverse reaction.